When you walk into the Canadian History Hall for the first time, you will notice the tremendous effort that has gone into its creation. Every detail of this major project has been carefully considered — including one that you won’t be able to see. Acoustics is not something that most visitors think about, unless it is overlooked, in which case we notice its absence: echoes bounce off walls, and sound from one exhibit bleeds into the next. There are so many sources of sound in a museum, from the crowd of visitors to the air conditioning unit, that the potential for a chaotic racket is enormous. It’s hard enough to control sound in a large, open environment like the new Canadian History Hall, but what if you also want to maintain its iconic architecture? And what if that architecture, while visually stunning, acts as a giant echo chamber? We’re talking about the Hall’s magnificent domed ceiling. The Canadian History Hall team, led by Chantal Amyot and including Douglas Cardinal — the Museum’s original architect extraordinaire — called on acoustic design expert Steve Haas to help. Sometimes referred to as a “sound cop,” he specializes in the delivery and control of sound, and he immediately identified the dome as a main acoustic challenge. 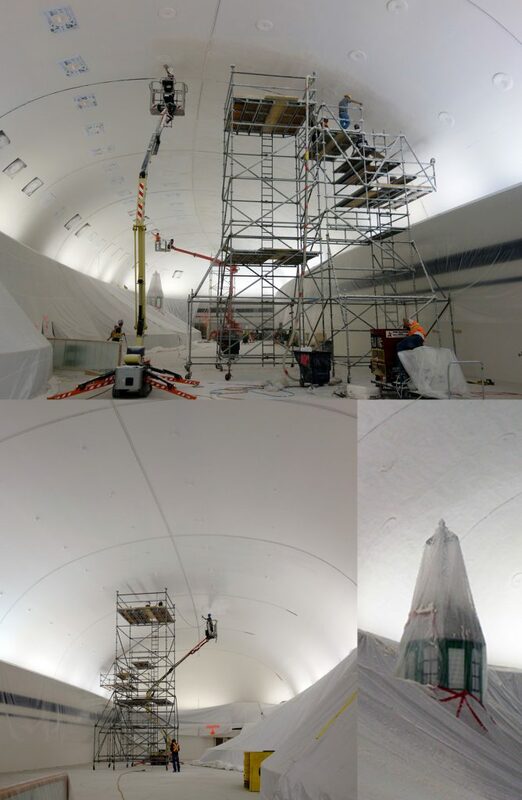 The solution to the dome’s acoustic challenge was to treat the ceiling with a fibrous spray material. The process involved careful planning and … a lot of scaffolding. If the dome were left untreated, it would not tame the sound; instead, it would send it careening around the rest of the space. It would be like having an art gallery with walls made entirely of glass, Haas explained. Imagine trying to look at a painting in the glare of a sunny day; all the details would be washed out. A barrier is needed so that the exhibits can be considered clearly by themselves. Sure, you can’t see his sound barriers, but you’d notice if they were missing! Luckily, thanks to the team’s tremendous efforts and attention to details — even the invisible ones — the new space can boast aural as well as visual harmony when it opens its doors on July 1, 2017. For more on this subject, see our previous post: Psychoacoustics: The Social Side of Sound.